Earlier this week, Amazon (AMZN) made the Echo — your personal digital assistant in cylinder form — available for public purchase. Prior to this week, only Amazon Prime members who had received special invitations were able to buy Echo. However, after seven months of tweaking and market testing, AMZN management has released Echo into the wild. Simply put, Echo is Amazon’s version of Siri, Cortana, and Google Now — the only difference being that the Echo device isn’t designed to fit in your pocket. Echo can perform many of the same tasks as the premier smartphone digital assitants from Apple (AAPL), Microsoft (MSFT), and Google (GOOGL, GOOG). For example, a simple spoken request can get news and weather forecasts, remind you of upcoming appointments, play your favorite music from Pandora (P), or tell jokes that would make third-graders roll their eyes. The Wall Street Journal said that Echo is “simultaneously a rival to a Sonos speaker and Apple’s Siri digital assistant.” One big difference between smartphone assistants and Echo is the link to Amazon’s shopping service. By telling Echo you need to buy common products, your purchase history is instantly examined for previous orders. If no orders are found, Echo will offer suggestions. Perhaps Echo’s most significant potential is its ability to serve as a home automation control hub. Amazon Echo can already control Philips (PHG) Hue lightbulbs and Belkin WeMo switches. While the home automation market is still in its infancy, it’s expected to grow at a CAGR of 56.75% through the year 2019 and be worth nearly $22 billion by 2020. There’s bound to be a few hiccups along the way, but with widespread adoption, AMZN could quickly become a formidable leader in the home automation space. 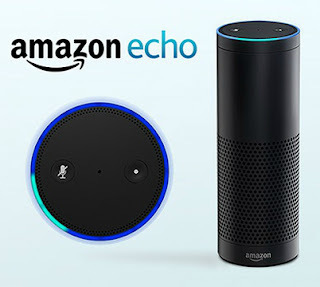 As the popularity of Amazon Echo continues to increase, AMZN stockholders will benefit, especially since Echo serves as more than just a hands-free automation control center (which, in itself anyway, is enough to capture some market share given Amazon’s global reach). With more than 41 million Amazon Prime members in the U.S. alone, less than 1% of whom own the Echo, AMZN has enormous untapped potential in the space. With its voice-controlled home automation and effortless product orders, not to mention free shipping for Prime members, there isn’t much standing in Echo’s way. AMZN has long been the king of online retail, as well as a dominant player in the cloud computing arena, and Echo can seamlessly integrate those two business segments while simultaneously foraying into another. Simply put, Amazon Echo is the perfect vehicle to connect different AMZN services and further the company’s expansion into new areas of technology. For AMZN stockholders, there won’t be any huge jumps in the stock price just because Echo is available to the masses. But, with continued development of the product and advances in home automation technology, AMZN is a great long-term buy if you’re looking to get into the space without much risk. Could Bing Search Ever Surpass Google?